To get the ball rolling on doing group camp outs for the members of this site, I thought I would throw this out there. I am planning a weekend outing to Algonquin Provincial Park on the Ontario Family Day weekend (Feb. 18-20, 2012). I've never done a winter camp out in Algonquin and had the following route suggested to me. Old Railway Bike trail accessed through the Pog Lake Campground then hiking to the top end of Whitefish Lake. This is far enough from the cars to get the back country feeling but close enough in case of problems. I was looking for a route that was fairly flat (minimum of hills) with essentially no ice crossings (too variable, and lack of confidence on my part) and definitely no bush wacking either. The only other criteria I need is to have some tree spacing in the 15' range as I use a hammock for my sleep system in my canvas wedge hot tent. Anyone interested in joining such a gathering? If so, post your interest in this thread. I think this could be a great deal of fun. If you're going to aim for Whitefish, why not park near the entrance off 60 and start in from there. Just non or minimal plowed campground road so easier hike or snowshoe in. access the interior at the Sunday Lake dogsled trail. Very flat if you don't go too far north, just detour at any point and find a nice spot. Sounds like fun. I might have been interested but that is the same weekend the DeepFreeze camp starts, and I will probably be going to that. The reason for the Pog Lake campground access was that it was literally across the road from the plowed out parking area for Kearney Lake campground. The Sunday Lake Dog sled trail is another option, however, I wanted to be in relative proximity to a lake so that there would be an easier water source than resorting to melting snow. Feel free to make other suggestions, as I said, this will be my first winter trip to Algonquin Park. I also realize it is the same weekend as the start of the Deep Freeze event, but it is also the one winter weekend that a 2 night trip can be take by most people without needing to use a vacation day. For people further south in Ontario, getting up to Sudbury to catch the Budd car for that event is a much bigger time commitment. Kinguq, have fun at the Deep Freeze event. I'm very interested. Couple of questions. Were you thinking of setting up the camp near the Whitefish "pow wow" group site? The campsite itself is off limits to winter campers so we'd have to find someplace at least 100m away. If yes, we can head in along the unplowed road or take the Mew-Rock lake bike trail then over some of Whitefish Lake. The bike trail is 10km from Mew Lake to Rock Lake - obviously much less to Whitefish. If the via the road, is there parking off 60 for our vehicles? For that matter is there parking at Pog Lake? Mew Lake is plowed as is the trailer dump/new sled lot across from Pog. There would be a real good chance that I'd stay behind for a good part of the week. Keep the base camp and day ski/show foray from there. fyi: Whitefish is a big lake that is normally wind scoured so usually no slush and deep ice. This is the route I had in mind. Yellow 'X' marks the spot. That seems OK for a 2-nighter so, if all works out, I'll join in. For the following week, I'll most likely head up to Blackfox, base camp, then day-trip to the west and north-west in the hopes of finding some trails into small lakes. The Sunday Lake sledding road (old logging road) is again going to be used for logging, so the Park pushed/bulldozed a large trail over the original Blackfox portage for dog sledding. It then heads east to join up to their usual routes. So the Blackfox portage has been flattened out and will be groomed for sled dogs. It's less than 5K from the road so easy doing now that Craig is keeping it groomed. FWIW, there are lots and lots of lakes for water in the sledding and surrounding areas. The eastern sled trail to and around Sunday Lake is used by some for a quick pull into and over nighter after a long day's drive. Sunday Lake has good water for winter camping. The route outlined is one I proposed to Brian last week at his Valens Conservation hammock-hang last week. The route is one that we have used on 5 other occasions over the years. The last few years, we have run into time restrictions for most of our group so this route provides a short haul, leading to decent areas to away into, but easy to leave as needed. This wouyld be ideal for new(er) backcountry trekkers. You could also park at the entrance to Whitefish, yet I am not familiar with the route from there to the dam crossing. The road through Pog Lake is, not to put too fine a point on it, a BAG DRIVE uphill when hauling a sled. Therefore, we follow the marked bike trail around it. If you don't mind the kms, you could follow the rail trail from Mew Lake Campground, where there is much more parking. You could even drop you're kit at Kearny Lake and shuttle pers back to pick up their cars at Mew. I may be able to come for the two days but I work Family day. So we would be snowshoeing in? Are we able to ski this trial too. for future ideas. We have always gone in Rain lake Road and skied or snowshoed into Rain Lake. From there it is an old railway line we followed. Some of it now is part of the upper section of the Western Uplands Hiking trail. Lots of moose come to check you out. We did ski lots of lakes on our travels. We skiied down to the Hwy 60 corridor. Other times, the snow was quite deep. Skiiers use the rail trail all the time. ok, that makes sense brian. for some reason I was thinking of the access from the pog campground proper. Well judging by this webcam of the Algonquin Snowmobile club, there is at least 1 foot of snow (where the pic was taken ). So hopefully 40km or so to the East, there is at least that much snow. Wooley, as for the scratches on the new sled, it was going to happen sooner or later, consider it character marks (unless the scratches catch snow). That's great! Blue Spruce Inn is where we are staying the night before we head into the interior! 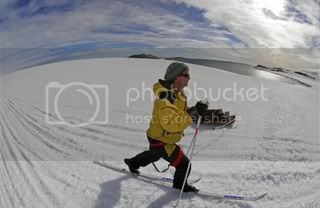 If everyone elese is snowshoeing then I would snowshoe. Just a thought. I just got my new Bivy today so I'll have to give it a test run. You have my interest. I'm off work that weekend and am interested in snowshoeing in and dragging in my hot tent. I'd head up Saturday morning and make it to the Park noon or so. Might take me a day to drag the tobaggan in being out of shape and all. Any idea the distance to go from parking to the camping area?